During the Halloween "season," there are plenty of haunted house experiences around Reno, and it seems the scarier the better. Some of these haunted houses are quite realistic and can be frightening— even for those who think they are prepared for the scare. Parents are cautioned to use discretion when taking children to these Halloween events. Some Halloween events are not announced and/or updated until just before Halloween. Check back for possible additions and updates. The Slaughter House is a professional haunted house that is reportedly really scary. You might want to read the Reno Fright Fest Warning before going to this haunted event. The Slaughter House is now at Reno Aces Ballpark, 250 Evans Avenue near downtown Reno. The catacombs beneath the ballpark await your visit. There will be free parking across from the ballpark. Hours are 7 p.m. to 11 p.m. Thursday through Saturday, Sundays 5 p.m. to 9 p.m., and extra late during the Reno Zombie Crawl and on Halloween. Only general admission tickets will be available at the door for $17. If you just can't wait to be scared, a Speed Pass for $24 moves you to the front of the line. The Speed Pass and group tickets (20 or more) can be purchased at the door or in advance by calling (775) 885-6999. Kingdom of Horrors is billed as Reno's scariest haunted house, so be forewarned. The haunting is based on the story of spooky stuff that went on at a Kilburn Estate deep in some swamp (see the website for the story), like people disappearing and having their souls stolen. Kingdom of Horrors is located at 515 E. 7th Street in Reno, next to Roller Kingdom. Starting in 2014 on Wednesday, October 8, Kingdom of Horrors is open on the following dates from 7 p.m. to 11 p.m. - October 8 - 11, 16 - 18, 23 - 26, 29 - 31, and November 1. Admission is $12, or $15 for a Skip The Line Pass. Get a $2 discount by bringing an empty RockStar energy drink container and you'll also get another drink. The information phone number is (775) 682-0998. Carson City's rich and intriguing history is explored and theatrically relived during these seasonal Ghost Walking Tours. The Carson City Ghost Walk is a spooky and enjoyable way to experience Carson City's Victorian Era and diverse past. Hear about lingering spirits of the past, haunted and paranormal stories. This is a guided walking tour of the downtown district's historic homes. This fall tour takes place just in time for Halloween, on October 18, 2014, from 10:30 a.m. to 2:30 p.m. Ghost walks begin at the corner of 3rd and Curry Streets. The 90-minute Widow's Walk visits the homes of several prominent Carson City residents from the past. The "Mini" Waif Walk is a bit shorter at 50 minutes and is especially for kids and families. Before and after the walks, there will be photo opportunities, tables, psychics and Ghost Walk merchandise for sale. Widow's Walk tickets $15 in advance, $20 on the day of the walk. Kids under 3 Free. Waif Walk tickets in advance are $7 for children 12 and under, $9 for older kids and adults. Event day prices are $9 and $12. Tickets can be ordered by calling (775) 343-6279. They are also available online (with a fee) from Brown Paper Tickets - Widow's Walk and Waif Walk. 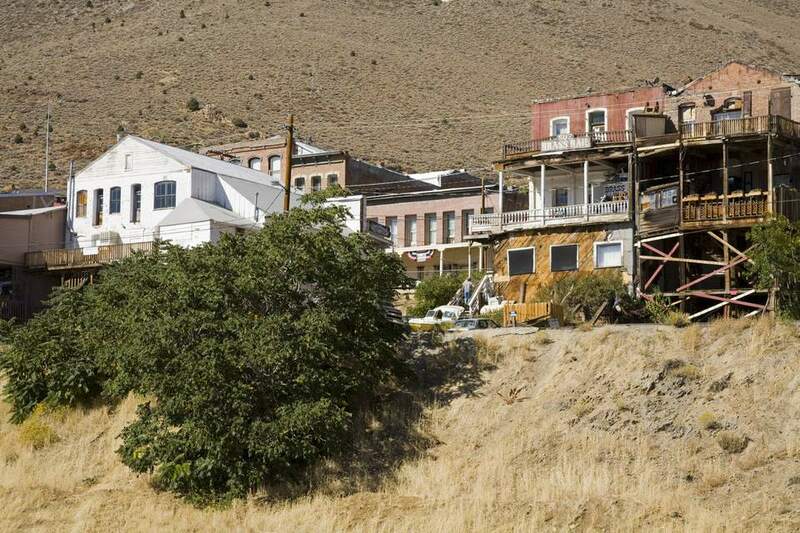 Find the ghosts in Virginia City during these walking tours. Hear the stories of those that have chosen to never leave the Comstock and see their eternal resting places, including the Washoe Club. Tickets are $30 per person and can be purchased in advance through their website. For more information, email contact@virginiacityghosttours.com.